We spent a month travelling Vietnam north to south, following the coast, and revelled in trying as many different dishes as we could. Light, fragrant dishes including phở, bún chả and bánh cuốn quickly became our staples, but the top spot was always filled by our favourite; bánh mì. 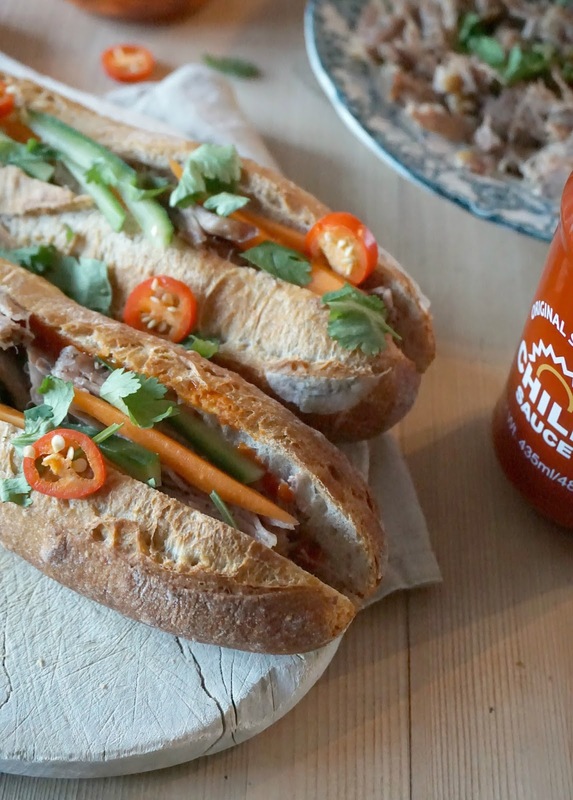 Vietnam was under French colonial rule in the mid 1800s and today the French influence remains, with bánh mì being a sort of hybrid of the two cuisines. 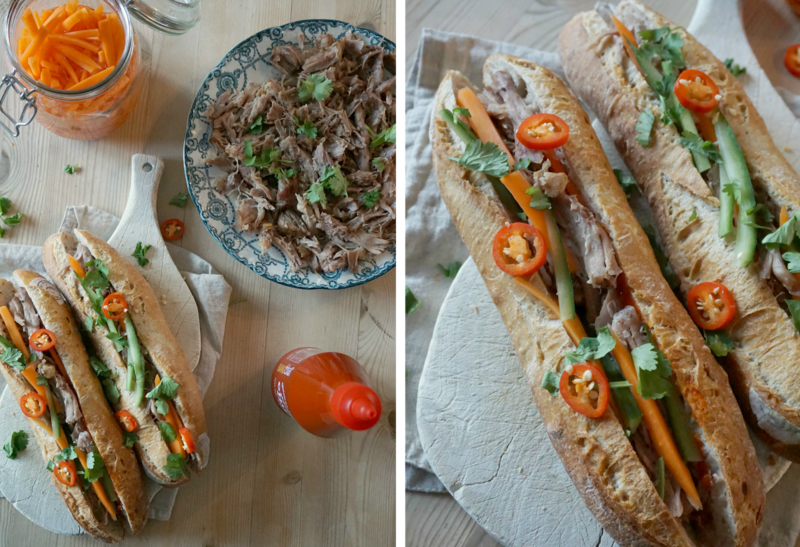 Crusty baguette filled with meat (or veggie option) then flavoured with chilli, coriander and pickled veg. Delicious. 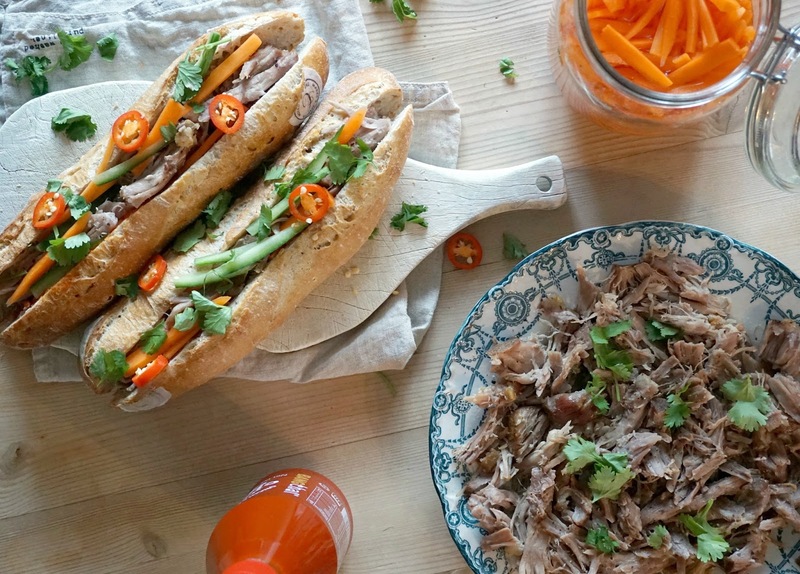 Depending where you eat, you'll see a whole load of different takes on bánh mì, and it can vary depending on which street stall or restaurant you visit and what city you're in. In Hanoi, we loved Bánh Mì 25 for it's basic-but-perfect approach to street-side dining. Picture small plastic stalls (which litter most streets in Hanoi; street food heaven), tiny tables and the most perfect baguettes with simple fillings that pack a punch flavour-wise. Since arriving back in the UK, we've been itching to have a go at recreating these ourselves! My favourite filling was pork with pâté - with chilli, coriander, pickles and in some cases this amazing gravy-type sauce. Mmmm. So we were keen to recreate our favourite, trying to tweak otherwise local ingredients to have that Vietnamese flavour we miss so much. The pâté we tried in Hanoi was just out of this world, which sadly we've not been able to find back in the UK. A legit reason to return? I think so! I wanted to do something a little different with the meat, so decided to use pulled pork instead of a simple sliced pork joint, but used a shop-bought pâté. I pickled the carrots myself, which was super easy. You will need; one small shoulder of pork. Place a shoulder of pork on a wire rack in a baking tray and pour water in to the tray (leave a gap between the water and meat). Cover with foil and seal it tightly round the edges of the baking tray to keep the steam inside whilst cooking. Cook for 4-5 hours on a low heat (150°C), taking the foil off for the last hour to achieve some nice crackling. Once cooked, peel the fat/crackling off and set aside. Put the pork in a large bowl and use two forks to gently pull the meal apart - it really is that easy! I added seasoning at this stage, as well as a few tablespoons of the meat juices from the pan to keep it moist and flavoursome. Peel and slice 500g of carrots in to matchsticks, and rinse with cold water. Sprinkle with salt and leave for 20 minutes or so, before rinsing, patting dry with a tea towel and then putting in a kilner jar. In a jug, measure 125ml warm water and the cider vinegar before adding the caster sugar and 2 teaspoons of salt. Stir until all dissolved, before pouring over the carrots. Close the lid and refrigerate for an hour or so before using. Buy fresh baguettes, and be sure to select ones which are light and airy rather than a heavier dough. Warm them through for a few minutes in the oven before hand, then remove and slice. Pâté; duck or chicken liver pate is best, spread thinly inside the baguette. Chilli sauce; sriracha sauce or similar rather than sweet chilli! Squeeze over pâté according to taste. Coriander; chop and sprinkle over the pork once added. Cucumber; I like to finely slice cucumber - removing the soft core - and add alongside the pickled carrots. The remaining pulled pork can be refrigerated or frozen and the carrots should keep for a couple of weeks or so in the fridge.